Doug is a local Tri-State area guy, he grew up in Bullhead City / Fort Mohave area and is an Alumni of Mohave High School. Currently serving as International Exchange Coordinators for Greenheart High School Exchange Year, Doug networks with the Tri-State residents to find qualified loving host families for high school age foreign exchange students each year. Another form of their commitment to the community and it’s youth. This bring cultural exchange to our local students, which in turn makes them want to better themselves, with numerous true life stories of how foreign exchange students have impacted local students for the positive. 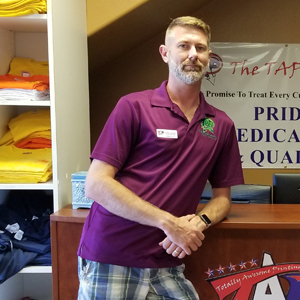 Having an extensive background in customer service and hospitality, he decided to team up with Louie to open Colorado River Tees/Totally Awesome Printing in December 2004. Doug heads up the embroidery department, over seeing the in-house digitizing department and embroidery production crew. Doug has received extensive training from Hirsch International, in Santa Ana, California for embroidery design, digitizing, and design layout. We aspire to create and embroider only the best product possible, for our customers. Working for 10 years in the grocery service industry, he wants to ensure that everyone that makes Totally Awesome Printing their choice for embroidered and printed garments is 100% satisfied. When he is not at TAP, Doug enjoys the outdoors, spending time at home and mentoring Foreign Exchange Students. ©2019 Totally Awesome Printing by Colorado River Tees LLC. All Rights Reserved!